CHAT4U is real-time web-based chat application built on Firebase using Facebook authentication, which offers rich user Interface, built-In Web/Image Google search option, responsive design that makes this web app easy on any device with the feature of sharing your status using emojis. Don’t just save data. Sync it. When data changes, apps built with Firebase update instantly across every device — web or mobile. Firebase-powered apps work offline. Data is synchronized instantly when your app regains connectivity. A Firebase itself is your realtime database, hosted in the cloud. Since Firebase is a NoSQL database you can easily store data as simple JSON documents. At a high level, Firebase is simply a database with a RESTFul API. Each individual Firebase has a name and its own URL endpoint. Therefore if your Firebase’s name is my-firebase, the URL would be https://my-firebase.firebaseio.com/. Using this API endpoint you can easily store and read data right out of your Firebase. Firebase isn’t just an API though. After data is stored in your Firebase it gets streamed in realtime to every connected client. This means that Firebase automatically updates all clients with the newest set of data. First sign up for a Firebase account. A new Firebase will be created for you with a unique URL ending in firebaseio.com. You’ll use this URL to store and sync data. Therefore if your Firebase’s name is my-firebase, the URL would be https://my-firebase.firebaseio.com/. Also, you’ll need to include jQuery in your website as well, which makes things like HTML document traversal and manipulation, event handling, animation, and Ajax much simpler with an easy-to-use API that works across a multitude of browsers. To get started with Facebook authentication, you need to first create a new Facebook application. Click the Create New App button in the top right of that page. Choose a name, namespace, and category for your application. In your Facebook app configuration, click on the Settings tab on the left-hand navigation menu. Then go to the Advanced tab at the top and scroll down to the Security section. At the bottom of that section, add https://auth.firebase.com/v2/<YOUR-FIREBASE>/auth/facebook/callback to your Valid OAuth redirect URIs and click Save Changes at the bottom of the page. Next, you’ll need to get your app credentials from Facebook. Click on the Basic tab at the top of the page. You should still be within the Settings tab. Towards the top of this page, you will see your App ID and App Secret. Your App ID will be displayed in plain text and you can view your App Secret by clicking on the Show button and typing in your Facebook password. Copy these Facebook application credentials (App ID and Secret) in the Login & Auth section in your Firebase Dashboard. First of all, extract “Chat4U_src.zip”. 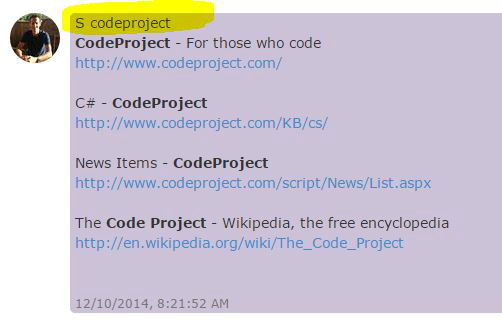 The code is very light and simple, and all included in Index.html file. Our data structure is very simple, data are split into separate paths which they could be effeciently downloaded in segments, we have two data paths called Messages and Users. Messages can be fetched separately and displayed as they arrive, allowing the UI to stay responsive and fast. Users are easily accessible (or restricted) we also store these by facebook id. Next step is to work on UI, User interface design important for several reasons. First of all the more intuitive the user interface the easier it is to use, and the easier it is to use and the less expensive to use it. The better the user interface the easier it is to train people to use it, reducing your training costs. The better your user interface the less help people will need to use it, reducing your support costs. The better your user interface the more your users will like to use it, increasing their satisfaction with the work that you have done. These two functions are for UI purposes. 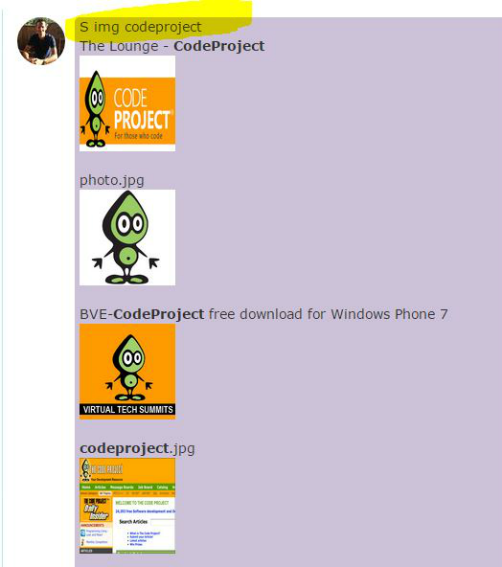 getLastBgColor: To get the background color of last submitted text message based on fabebook id in firebase. getLastDirection: To get the last submitted text message direction in firebase. Next, we retrieve last 10 saved messages from our Firebase data and generate the html elements on the fly. And the final step is to write data to Firebase by pressing the send button. //Set current text message direction to push it to firebase. //Generate random color to set the background color of the text body. You will need to sign into your firebase account. 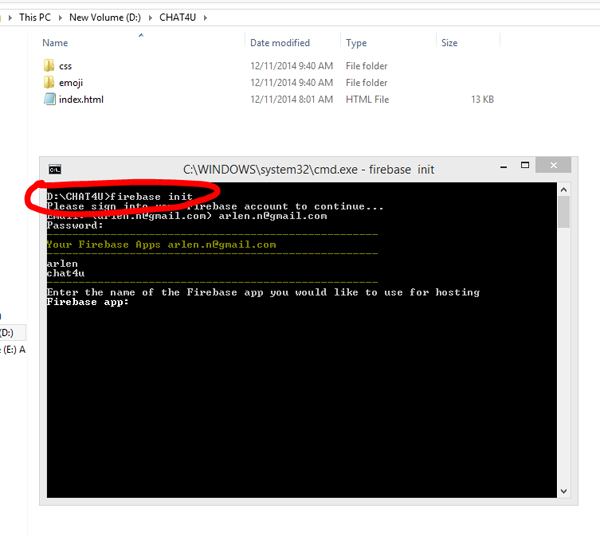 Enter your firebase app name and press enter, for public directory just press enter to continue. 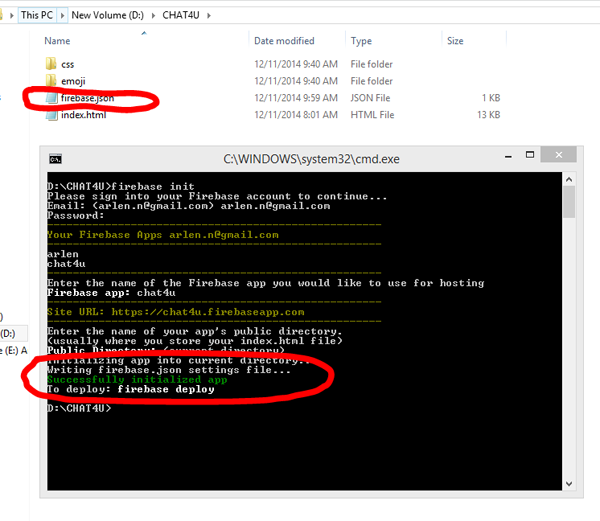 As you can see the new file has been generated in your application directory called firebase.json, now we are ready to delpoy the files to Firebase hosting environment. To deploy run “firebase depoly”, this will deploy your application to your-firebase-name.firebaseapp.com.